Having very limited space in my garage workshop I finally broke down and purchased MLCS’ Cast Iron Router Table Extension. This table replaces a Bench Dog table and a Rockler table. It’s mounted on your table saw replacing one of the existing cast iron extensions. The cast iron table is very heavy as my UPS guy will attest to. It came securely packaged and well oiled. After cleaning off the oil I removed the existing TS extension, in my case it was the left side of the table. I placed the existing extension next to the new MLCS to see if there would be any issue with the placement of the bolt holes. There wasn’t (more on this though). The instructions were very detailed as to how to mount the table to your table saw. I did as I was told. Everything went well. It is heavy, so have another person or some way to support the table when attaching it. When mounting the front (the short side) to the table saw rail the holes did not match up. No Problem – I just drilled a hole through the existing hole on the rail and into the cast iron table. I’ve never done this and thought there would be long hours of drilling … NOT … in a minute or 2 the hole was there. NOTE: when doing this make sure the table is level and flush with the table saw top. The router plate came flat and it was easy to drill matching holes for my router. The hanger holes for the fence were not drilled completely through, consequently, I didn’t install the hanger brackets. I don’t know if I actually would have hung the fence there anyhow – I think it would just get in the way when using the router without the fence. 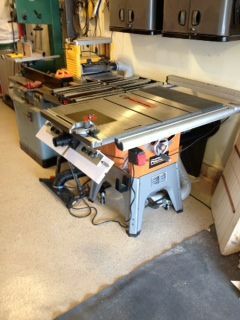 I did notice, after all was complete, that new table did not completely match up flush to the table saw top. I tried to reinstall the top now an easy thing to do just loosening up the screws slightly and trying to jack it up slightly … no luck. It is .0070” below the table saw top. I figure someday I’ll remove the extension and file the holes out slightly, but I seldom if ever use that side (left) of my table. It’s a hybrid left tilt table and I’m left handed – I most always stand to the right of the blade so it’s no big deal to me. The folks at MLCS were quite gracious with my many questions prior to the purchase. They provided me with the hole placement to attach it to the saw and informed me it was an easy task to drill the rail hole. When I mentioned the hanger brackets were not drill completely through they told me the type and size of tap I would need – but I doubt I’m ever going to do that. All in all my fears of trying to install this to my table saw were for nothing. I wish I would have done it years ago. I now have more room in my little shop which was immediately taken over with my dust collector. As side benefit is that I can now cut a piece of wood and, if needed, slide over to the router table side and route and edge or whatever without having to move everything around in the shop. I gave it 4 stars because I will someday file out the holes to make it flush and because the hanger brackets weren’t drilled through. None of these are a show stopper for me though. I have the peachtree version and mine sits just a hair under the main table. Has not affected performance, but one day I too will file out the holes and raise it up the couple of thousands. BTW, I am also left handed and have a left tilt saw. We are indeed taking over! Count me as another left-handed left-tilter! Nice review. I’m not quite clear on how the fence mounts to the table? -- "Of all the things I have lost in life, I miss my mind the most." MLCS has free shipping ,was that the case for this extension table ? Come on fellow lefties ,we were brought up having to do everything with our right hands as well as our left we can do it all with either hand. Nice review, I bought one of there tables as well. Not the cast iron one as I thought it might be to heavy. Glad you like your! MLCS has some good products. Very happy with this product and much better price than the benchdog. A little modification was required but it is clearly stated to be universal so that is to be expected. Thanks for the review it helped me pull the trigger on this purchase!